For the curious (thank you, tuftears) Here are the current details and at least one picture of my pies. 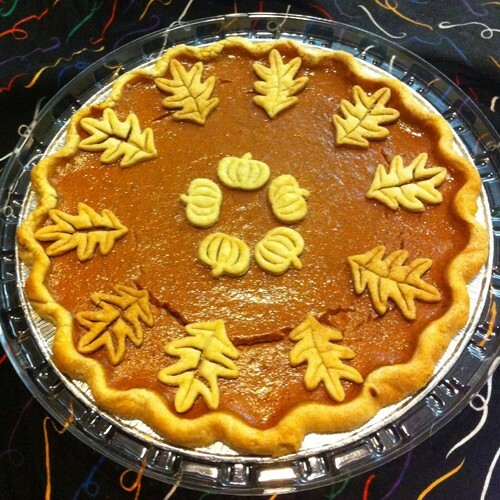 Spicy Pumpkin Pie: Using local-grown heritage pumpkins known for their flavor and fine-grained flesh, this pie is loaded with spices and yet balanced to still bring out the pumpkin goodness. No fluff here, this is a solid pie, capable of being eaten out of hand (as I've done many a time). Special deal: 2 pies for $30 if you pre-order. Special Needs Pie: Allergies? On a diet? I can make the above pumpkin pie Sugar-Free, Gluten-Free, and/or Lactose-Free (and yes, I've made one that was all three). Still every bit as tasty and yet digestable for those who have dietary restrictions. Apple Pie: Limited Edition! I managed to harvest a some apples from our backyard tree which is an heirloom variety once popular in Northern California but is now an endangered cultivar. Along with a known great cooking apple, the Braeburn, this pie is flavorful with just a little tartness, stuffed with apples and covered in a lattice crust. I think I have enough apples to make a half-dozen pies, so get your order in early! Mincemeat: This year will feature a sampler-pack of mincemeat, as I don't have enough of any one to make whole pies. On the bright side, you can help choose which mincemeat I'll be making for next year! There are three varieties: Elizabethan, PostWar, and Modern. PostWar was handed down through the Rombauer family (Of Joy of Cooking fame), and is equal parts meat and fruit, less sweet than a modern recipe but definitely a dessert mincemeat. Modern was gleaned from online reasearch and newpaper articles on mincemeat, where there is no longer any meat in the recipe at all. Very much a sweet dessert pie with a hint of savory from suet. For those who are curious about the evolution of mincemeat, there is the Sampler Pack of all three flavors, four mini-pies each, for $15. For those who know they only want one kind of mincemeat, I have the Personal Pie: a small (5") deep dish pie for $8. Specify which mincemeat you want. You can send me private mail for pie requests. I accept Paypal, checks and cash. First come, first served. I will be making pies through December. My PayPal account is ermine(at)Dancing-Stoat.com (which is my business name). Say I want it for Thanksgiving, how does the timing work? Do I get it from you beforehand and stick it into the freezer, then heat it up in the oven on that date? You tell me when you want it -- if you're planning to have it extra early, then yes you'll put it in the freezer and then heat in the oven on the day you'll serve it. For folks who will be picking it up to travel, I can have the pies frozen and ready to ship. Otherwise, they will be fresh baked and chilled. Please let me know if you need an extra set of hands for prep work. Just wanted to say, that pie looks awesome. I witnessed a foodgasm tonight when someone tasted your pumpkin pie. I am compelled to order 2 pumpkin pies.